How’s that for a fashion statement? 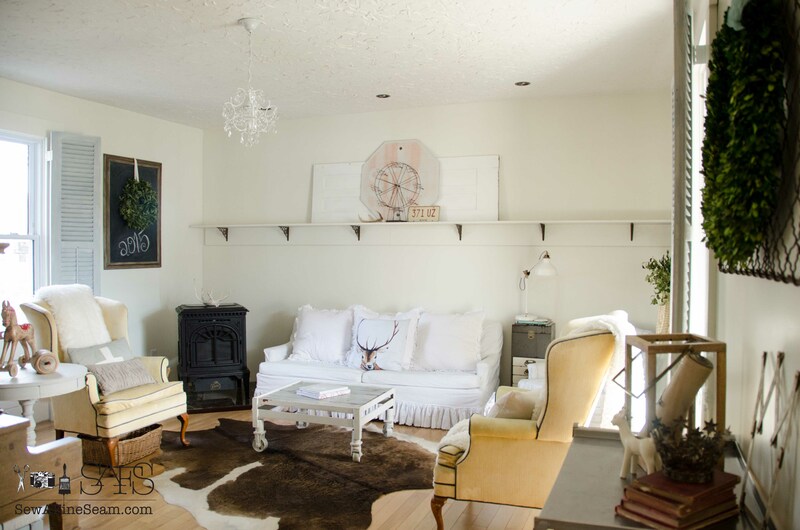 A Chandelier and a Cow Hide Rug. Can those two items really co-exist in the same decor scheme? If you know me well at all, you know my answer. Peeking in from the dining room – see? They work together wonderfully! At least in my house they do, and in my house what I love is what works. I posted a few months ago about living with white and shared my living room. (I still don’t have those chairs slipcovered, but I do have the fabric on hand now) This photo shows my typography, bamboo rug. I still love that rug and will use it again somewhere, somehow. This photo also shows the ceiling fan. When we redid this room we needed the fan to circulate our heat in the winter, which came from that corn-burning stove you see in the corner. Without the ceiling fan running, set for an updraft for winter, we didn’t have a warm living room let alone any warmth in the other rooms. But since the furnace went in, and then the a/c unit was installed we don’t need this ceiling fan at all. I was determined to change it out. Sooner than later. I wanted to create my light fixture out of some elements I had and some I needed to purchase. But my hubby would never give me the assurance that what I wanted to do was going to work. And I got tired of waiting and looking at that ceiling fan every day. 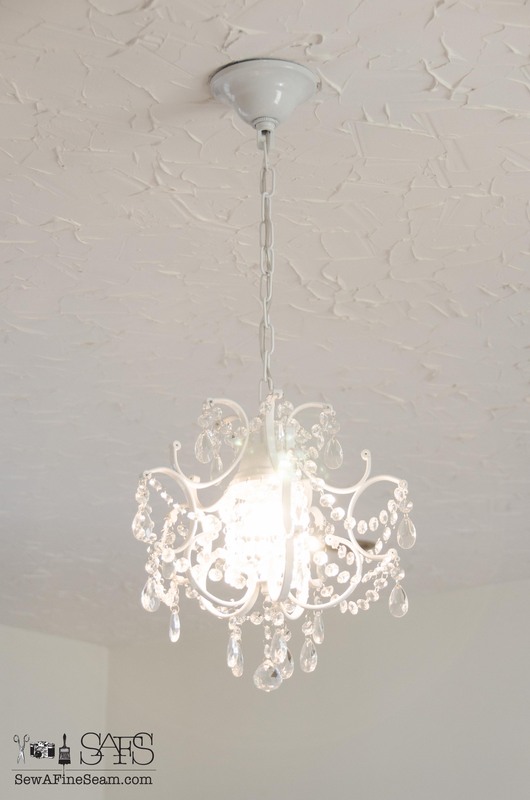 Did you know that when you order a chandelier it comes without the crystals on it? They come in little bags, all labeled neatly to correspond to the diagram they include that shows you where each different style of crystal goes. And after the light is installed you get to stand on a ladder and attach each crystal. 😀 Unless your husband (or yourself) will install the light after the crystals are attached, in which case you could attach said crystals while the light is lying on the table instead of hanging from the ceiling. My husband wouldn’t let me do that, thus I was standing on a ladder attaching crystals to my chandelier while my family tried to watch the football game around me. 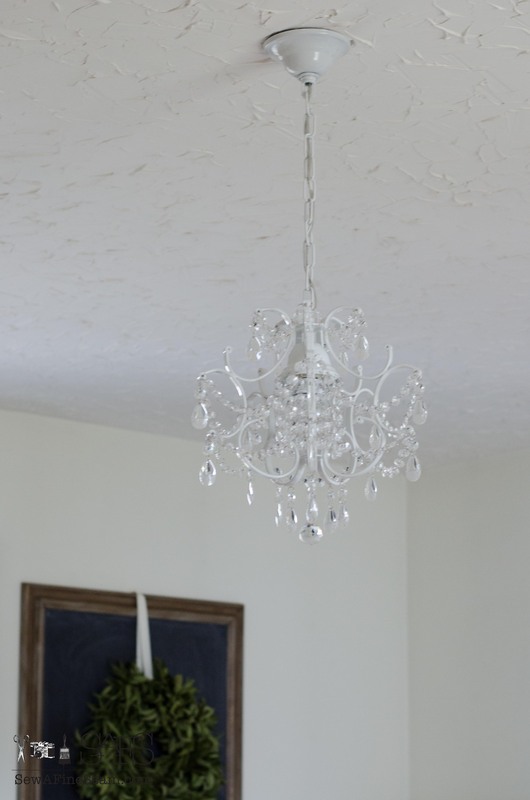 Chandeliers give off such a pretty, soft light. My teenager loves the rainbows the crystals cast everywhere when the sunlight comes in and strikes it just right. And the cow hide rug. I know the animal head/cow hide thing is controversial, but I’m going to boldly say that I love my cow hide rug and yes, it is the real thing. It is the softest thing I’ve ever felt underfoot. I have looked at the cow hide rugs at IKEA every time I’m there (and you know I’ve been there a LOT lately due to the high volume of pillows I’ve sold) I bought a cow hide a couple of years ago at IKEA and gave it to my brother-in-law for his birthday. He has it hanging on the wall in his office and it looks great as a wall hanging too. All the times in the past I’ve stopped to ‘pet’ the cow hides at IKEA a bit. I look longingly and wish I could bring one home. But even though I loved them, none of them were quite tempting enough to make it into my cart. Till this time. This one was laying on top of the stack. A perfect array of warm browns with just the right amount of white to satisfy me. 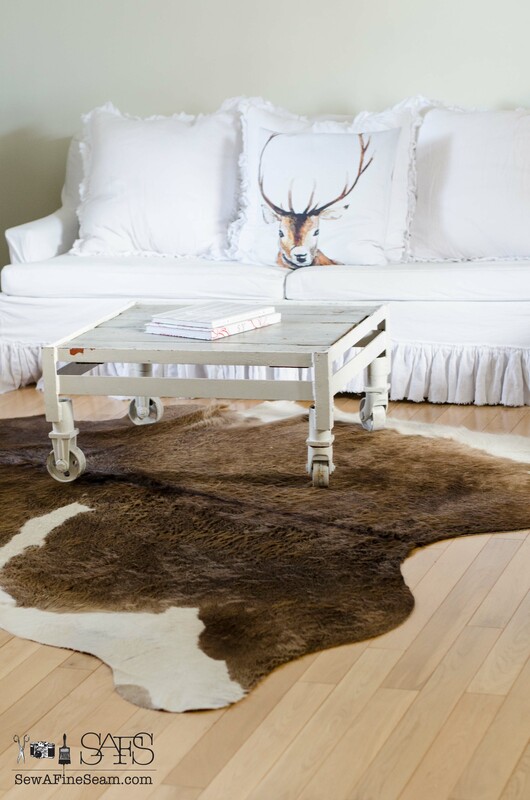 (I really wanted an all white one but they are hard to come by and the cheapest I’d ever seen one was $400) (IKEA has never had cow hides that came close to being all white) My teenager was with me and she loved the cow hide too. And she knew I loved it. She promptly folded it up and dumped it on top of one of our cartloads of pillow forms. I barely protested. I liked it too much to protest. I really like the blend of decor elements I’ve got going in my living room. The wingbacks I will like better when I finally take time to slipcover them. If I can just get the pillow orders under control in the next week I may just sneak that in. Naming my decor style isn’t something I really do. Eclectic at best but I’m not sure that even really fits. I do what I like, I keep what I love, and I change things up often. What is the stencil project?! I love the chandelier and rug in your room! It is really a stunning setup. I’ve been working to create a good setup in my house as well. 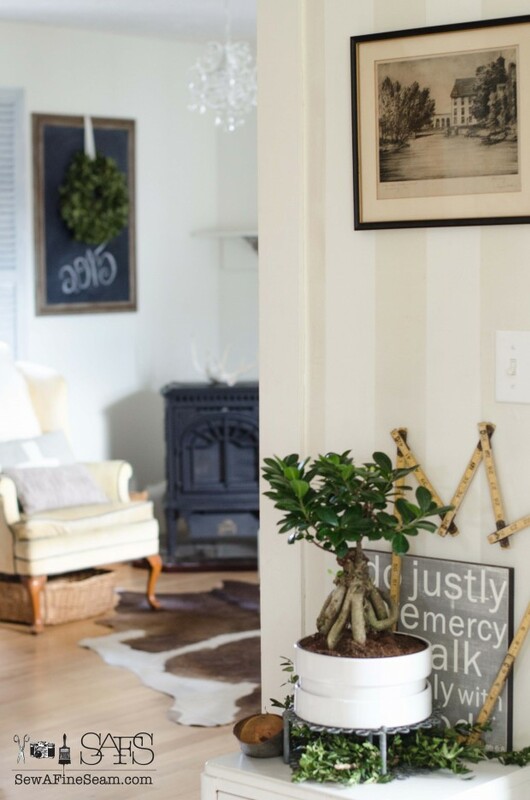 Just posted about my entryway. It’s been fun decorating for our family and getting to surround myself with what I like too. Thanks for sharing! Thanks so much! And your entry is beautiful! Love the textures you used and the bright airy feel! Great pictures! I love the hominess of your room. The wingback chairs are comfy as well as pretty. Slipcovers will give them just what they need. Chandi and cowrug coexist very well! I like your touch, always comes out looking great. Love everything about these photos! We’ve been on the hunt for a hide as well. Hopefully we’ll hit the jackpot @ Ikea one of these days! I never would have thought to look at Penney’s for a chandy! Thanks! I love yours and I think it’s just perfect and I’m going to look there (I’m working on our den…more on that soon). The rug is beautiful. I think it has a sort of country vibe that goes really well with your pretty and simple look. I have a hard time defining my style, too. I didn’t really either but it came up in a search so I looked! And yes, I’m working on pillows every day! even with 2 seamstresses helping me sew them up we are swamped! Over 200 ordered now this month! 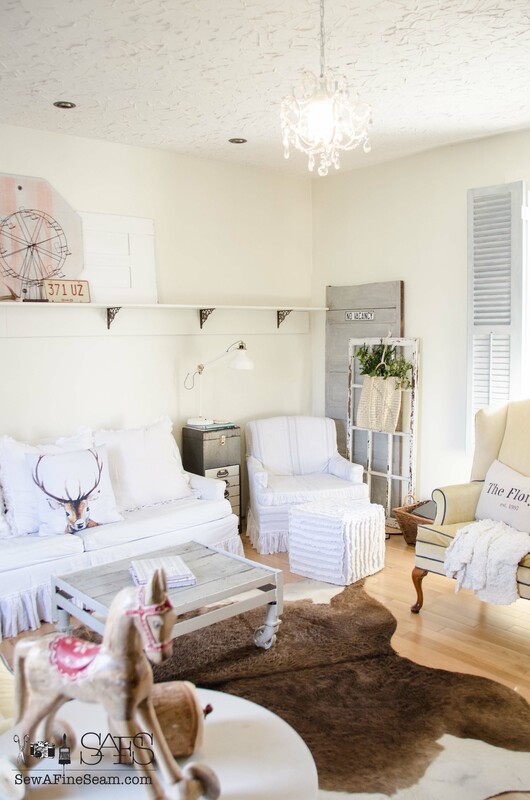 Nicely done Jill…I love the juxtaposition of formal & rustic/casual. You nailed it! Thank you so much! I’m loving it! I absolutely love your chandy, so pretty and delicate. I think if it was bigger would be too much for that room. Your room is so welcoming and comfy looking, what a living room should be. 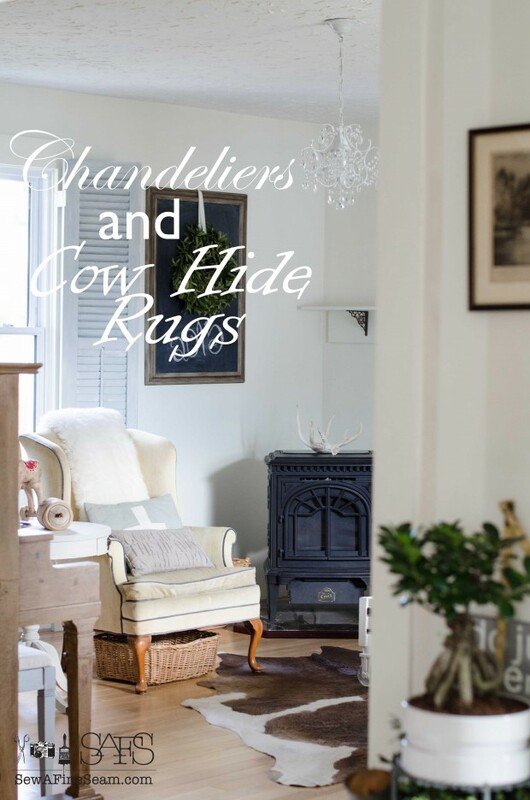 With addition of rug and chandy it’s a wonderful contradiction, what you love (me too) and that’s all that matters. Who cares if somebody else doesn’t like it? 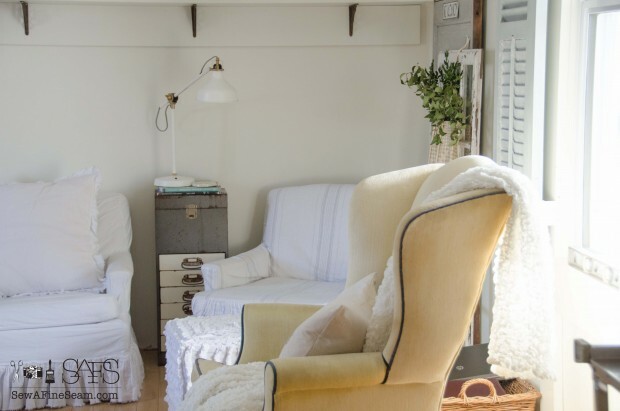 Do you love everybody’s rooms you see? Would they work for you? We are all individuals and that’s how God likes us, have minds of our own. Do you think God understands modern women and how we behave and think? Haven’t forgotten I promised you something I want to send you. Have to get hubs galoshes on so I can get down to shed to get it out.It’s warmed up here, low 40’s during the day so snow melting and mud has taken it’s place. Still have Christmas decorations behind chair in living room to get out of way. Can’t get down to get box out of shed for them. Hate the mud. Dog comes in with muddy paws then hates to have his feet cleaned. If we don’t clean them, what a mess all over my – what were – clean floors in kitchen and mud room. arrrggghhh. So don’t give up hope, someday soon a little box will arrive for you. Luckily I kept box you sent stuff to me in so your address is on it. I am still getting used to new pc, finally got Google installed so I could access my emails, boy am I behind now. Having problem getting my hands in right spot to type on new keyboard. I end up having to fix things I’ve typed all the time. Do get bit frustrated with that but hopefully will get used to that also. I’m finding windows 8.1 different than 7. Me most likely but am determined to figure it out. Had to order new printer as old one not compatible with new pc. blast it. Better go dear friend, hope you and everybody in your house are great. Happy New Year. Thank you JaneEllen! I love the chandy too. And yes I absolutely believe God understands us completely! He created us after all 🙂 Do worries on shipping me anythign! So sweet of you to think of me – makes my day. I don’t like mud either. My girls like to play outside and somehow love the mud when it’s around! Muddy shoes make me grumpy! I’ve heard lots of people talk about how hard windows 8 is – not sure I want to deal with it, so I’m sure it’s not just you 🙂 Have a great weekend! Sometimes I am tempted to have someone decorate my home, but I doubt if I would feel comfortable in it, as each piece I have means something. I am 61 years old and I am getting to where I don’t care what others think about my clothes, my home decor, etc. etc. It is what makes me comfortable!!! If you really wanted someone else to do it for you – look for someone who will find out your likes and dislikes and work with you instead of doing it all themselves! Sometimes another eye and someone who wants to HELP you figure out what you love can make all the difference! I love the cowhide in this room! Such a beautiful house…so excited I came across your blog! Thanks so much Deb! And I have to say I love your blog name and your blog header! Beautiful! I am also looking forward to the followup on your mothers stenciled wall. Thank you Brenda! I just finished my Mom’s wall on Friday and need to get the pics off my camera! Thank Rebecca! 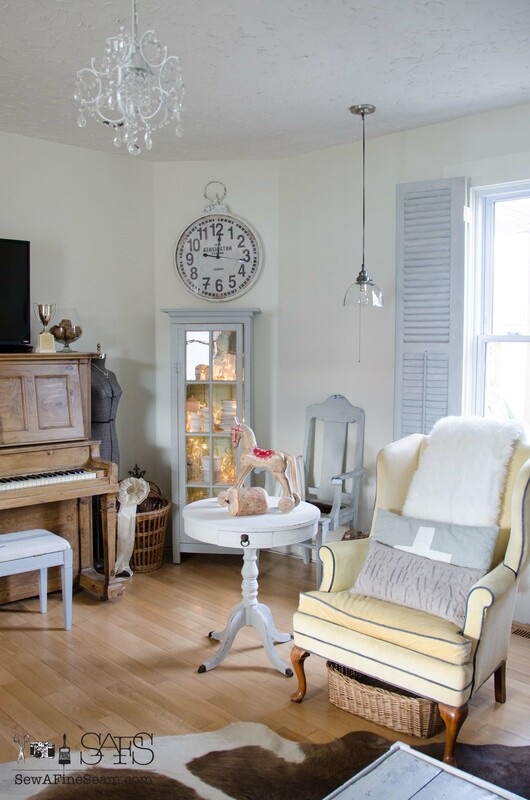 I think that’s what makes a well decorated space a real home – when all the elements are things you love! 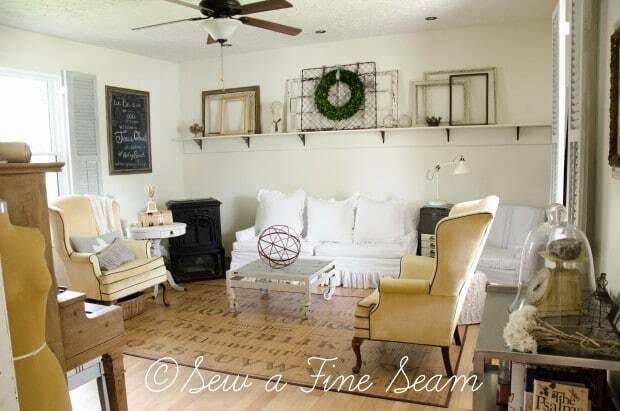 Love the rug! I’ve always wanted one too but my husband always crinkles his nose and looks at me all crazy! 🙂 Thanks Becky! Maybe if you just get one your hubby would actually love it? I find that’s how it is for me a lot when my hubby acts like that! Your room is beautiful Jill! 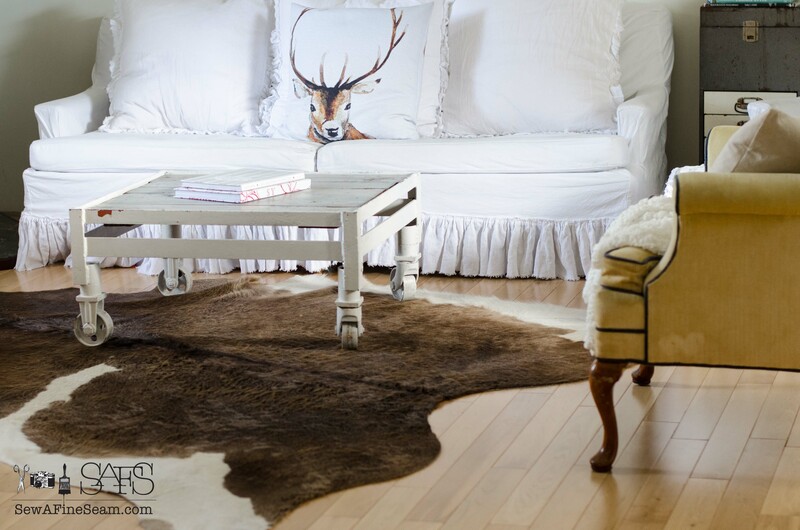 I love cowhides and think they add so much to a space! Thank you Kris! I’m loving it so much!